If you may ask me which is the most popular CMS widely recommended for blogging? My answer is WordPress. WordPress is one of the most popular CMS which is not only popular among bloggers but also among web designers. It is one of the most extensive platform. WordPress is even popular among e-commerce website designers. you are one of those who do not need to invest too much and still want to create an online eCommerce site than WordPress is for you. WordPress even allows you to give your eCommerce website rocking style and boost it with awesome plugins. Now you may ask that which is the best and most popular plugin to start eCommerce website on WordPress, my answer is Wp e-Commerce plugin. Wp e-Commerce plugin is a free yet very powerful plugin which offers community support for all. Today I am sharing a guide to start an eCommerce business with WordPress using Wp e-Commerce plugin. You will learn how to start WordPress eCommerce site. To start an eCommerce site, you need to buy web hosting and domain to start a WordPress website. I do not recommend you to go to free WordPress hosting providers. After creating a website on WordPress platform, it is the time to do some serious job. 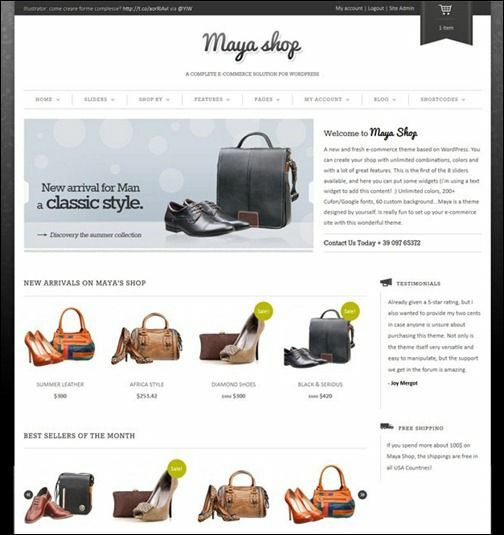 Now you need WP eCommerce plugin to treat all posts as item page. Now first you should delete all pages and posts. Also setup some categories such as "Mobiles or LED TVs". Enter /%postname%/ in text box. Follow essential starting WordPress setup steps. Now let`s start Wp e-Commerce plugin installation. You can read here easily install a WordPress plugin. There is product menu in dashboard and store option in settings of your WordPress dashboard. You can add new items using product menu. Select Static page under Front page. Choose the Products Page as front page. Now customers will see a default page. Set the amount of time. Choose Add to Cart Button Type. Alert Notice given on page. Enable or disable options related to presentation. Set "Display Per Item Shipping" option. Select Widget as Cart Location. Display “More Details” Button options. Now set the product image. Enter your email address in Reply Address. In Reply Name enter name of the company. Edit the Purchase Receipt & Admin Report formats. You can even enable Free Shipping Discount. Define Payment Gateways. You can use PayPal Payments Standard 2.0. Use them to make your eCommerce site popular on social networking sites. Now your eCommerce site is ready. Now install an attractive WordPress theme and start populating your site with products. Now, you can sell product using WordPress powered e-Commerce website. Always choose a theme which is attractive and also easy to navigate. If you still have any question about how to start your own eCommerce business with WordPress using Wp e-Commerce plugin or any other question, feel free to ask via comments. Don`t forget to share what you like. You can even subscribe eAskme newsletter and like us on Facebook to stay tuned with us.